Offering a clean, fume-free environment for laboratory professionals is the mandate of the new solvent dispensing system now available from PPT, the leading US manufacturer of solvent purification and dispensing systems. This innovative system addresses the concerns of all researchers who need to maintain the safety of their lab environment. This includes controlling spills, protecting the lab equipment and instruments, and preventing the contamination of on-going experiments from each other. An important characteristic associated with research lab operations and clean-up that’s often overlooked is the air. Gases and chemical fumes are constantly released into breathable air. 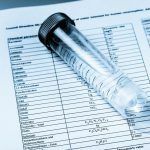 Whether visible or not, these fumes are a constant health risk and without proper filtration the lab environment becomes contaminated. Traditionally hoods with HVAC venting have been utilized in labs during the dispensing of solvents. This should now be categorized as a complicated, space consuming method of removing fumes from breathable lab air. In addition to requiring expensive venting equipment, this method dictates the spatial positioning of the system. In other words, where the solvent dispensing system ‘has’ to be placed as opposed to the logical, convenient placement required for a smooth flowing laboratory process. The PureCapture™ solvent dispensing system employs a filtering system, created by world-renowned laboratory safety enclosures expert, Erlab. In partnership with Erlab and utilizing their low carbon footprint filters, PPT has created a quality built, reliable, safe way to dispense solvents in a self-contained unit that captures fumes emitted during the process of transferring solvents to receptacles. 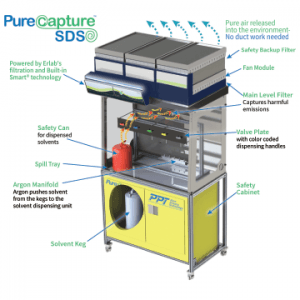 The lack of venting required, along with the recycling of filtering contaminated air into clean breathable air, makes the PureCapture™ SDS an essential investment for the laboratory, pharmaceutical, medical research, and R&D markets. 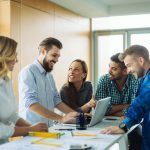 To create a better product, one must combine the highest quality materials, extensive knowledge of the market, and the latest user-friendly technology. In accordance with this ideology, the PureCapture™ cabinet frames are constructed with durable extruded aluminum. A phenolic resin tabletop workspace is mounted to the extrusion frame, and kegs that store under the tabletop in a safety cabinet. 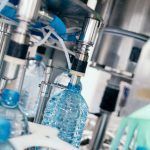 A dispensing valve plate with controls is mounted to the extrusion frame to allow the effortless, safe dispensing of solvents.